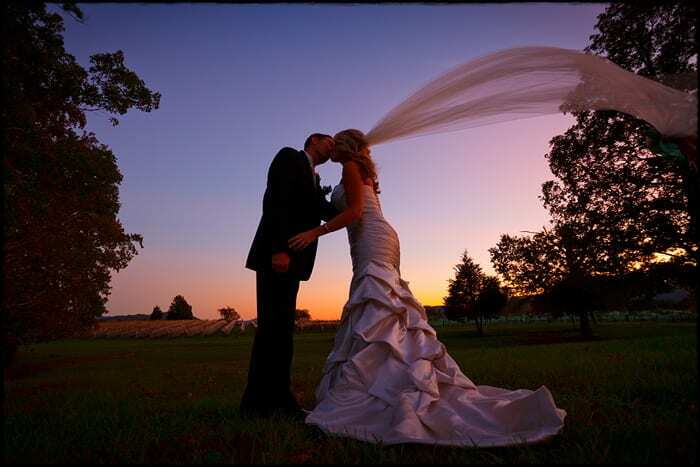 Veritas Vineyard weddings have yielded some outstanding photographs for us over the years. Gina and Ivey’s wedding was a special night, as their wedding took place close to the time change on a Sunday evening in October. When the wedding ended, it gave us just enough time for a few portraits and then some outstanding light arrived. The magical waning moments of polished, rich color require a photographer to shoot quickly as the best part of dusk does not last for long. We had just finished a few images next to the vines and I was lying on the ground, looking at the intensity of the sky, and immediately made the exposure – knowing that I only had seconds before the everything would change and the light would dramatically fall off.